Masood Akhunzada was born 1976 in Kandahar and hails from the Alokozay Tribe. He is tribal elder and a member of a prominent religious family in Kandahar. For 250 years, Mullah Masood Akhundzada's family has protected Afghanistan's most sacred artifact: the "heavenly" cloak (Kherqa-ye Sharif) said to have been worn by the prophet Muhammad. Today, the Cloak is hosted in its namesake shrine in Kandahar, the Kherqa-ye Sharif, a mosque standing in front of Ahmad Shah Durrani’s mausoleum. The cloak is locked within three boxes, the first two wooden, the last made of silver.I ts power drew Afghan kings and presidents and Taliban leaders to the small, blue shrine in the city conquered by Alexander the Great and contested ever since. By the time Masood Akhundzada inherited the guardianship in 2008, it was an honor that came at a high price. Five previous guardians — his father, brothers and cousins — had been assassinated, shot in their offices, in markets and airports. They were hunted, most believed, for their connection to a piece of Islamic history that the insurgency wanted desperately to reclaim. Most residents of Kandahar say the story of the Akhundzada assassinations begins in 1996, when one-eyed Taliban leader Mohammad Omar visited the Shrine of the Cloak. The Taliban had recently taken control of the city and was on its way to Kabul. "Here I am. Let me see it," Omar told Qari Shawali, Akhundzada's brother, according to witnesses. The family didn't anticipate Omar's next move: He carried the cloak to the roof of a mosque in central Kandahar a week later. As thousands gathered below him, he put his wrists into the garment's short sleeves. Taliban mullahs exclaimed, "Amir-ul momineen!" or "Commander of the Faithful!" During the Soviet occupation, Akhundzada's father was killed when militants demanded that the cloak be taken out of Afghanistan — and away from perceived anti-Islamic influence — but he refused. This time, though, the problem was inverted: The new leaders of Afghanistan were Islamist extremists who saw the cloak as the source of their power. Suddenly, Akhundzada and his brothers and cousins found themselves protecting their jewel on behalf of the Taliban. As soon as the Taliban took power there was cause for concern: Akhundzada's brother, Mohammed Mehadi, a former guardian of the cloak, was killed in Pakistan's Karachi airport. With Karzai's approval, then-Kandahar Governor Gul Agha Sherzai, Pashtoon and several others slaughtered goats and cows as a sacrifice to the sacred place and went on to inspect the shrine. Akhundzada's brother, Qari Shawali, unlocked the three boxes made of wood and silver that held the cloak. "There it was — brown and well-kept and very beautiful," said Pashtoon. The group prayed and wept, and reported to Karzai and U.S. officials that the cloak was indeed in the new government's hands. 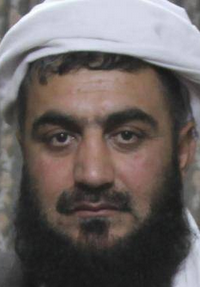 Akhundzada's nephew, the leader of Kandahar's top religious council, was killed first, in 2005. He was shot in the face in his office. Then in 2008, assassins killed his brother and his cousin, both custodians of the cloak, as they walked through a local market. When the family decided that Akhundzada would become the new official guardian of the shrine, he was resolute. Weeks later, Akhundzada was nearly killed in a suicide bombing. "Even if they try to chop my family to pieces, I will protect the cloak," he said. That declaration contained one unmistakable irony: Akhundzada has never seen the cloak that he is willing to die for. It has remained locked deep inside the shrine since he took his position. Until the president asks for it to be unveiled — which he hasn't since 2002 — it will remain unseen, even to its guardian. The cloak—a camel-fur garment - said to have been woven by the prophet Enoch and presented by God to Muhammad after his Night Journey to heaven. Ahmad Shah Durrani brought it from Bukhara in 1768 and appointed the Akhundzada family as its guardians. Since then, the Akhundzadas have guarded the cloak mostly from politicians like Ahmad Shah. When he wanted to be entombed with it, they cried blasphemy, and he relented, powerless before clergymen with a scrap of cloth. The cloak’s prestige has, for the most part, kept the Akhundzadas safe and prosperous, as custodians of both the garment and the endowments that exist for its upkeep. The cloak has no seams, Masood said and no color. When on display, it can cure disease, convert the faithless, and end national disasters. The guardians allowed viewings during a cholera outbreak in the 1930s, and the cloak arrested the epidemic. Decades later, it quenched a drought.